OMG what an adorable cane tag!!!!! OMG Miss Brigit What a Gorgeous Tab!!! Your Candy Cane looks so real....how did you do that? The look is Spectacular....WOW!!! Love that dotted paper it so showcases your Candy Cane Magnificently....and loving too your Holly Leaves...you most certainly did a Super Outstanding Creative job!! YOU so ROCK!! Cute tag!! Love the candy cane! Very cute with the polka dot background and I like the shading on the candy cane. Awesome tag! Love the coloring on the candy cane! Very cute! Love the polka dot paper and scalloped bottom edge also! Darling tag! 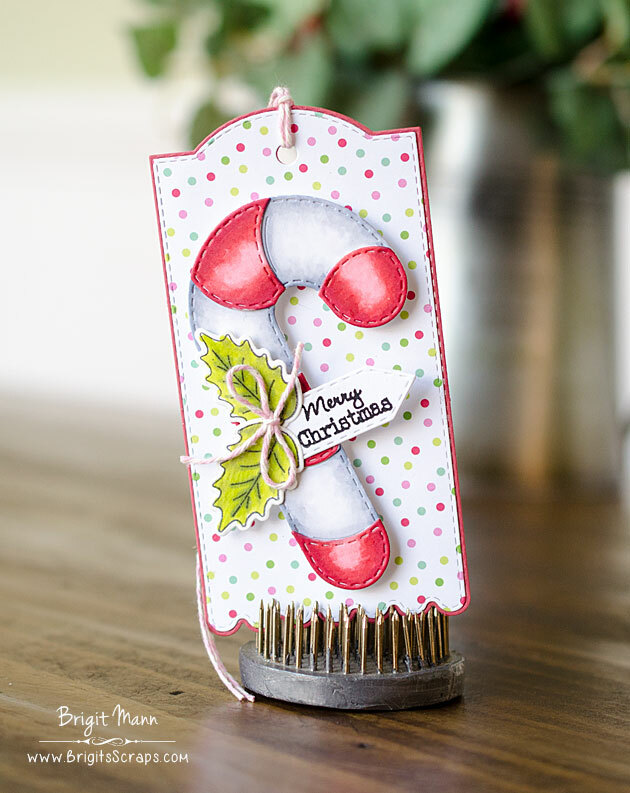 Love the candy cane and the bright fun colors you used! I love the dimension and great coloring. So pretty! So stinking cute. Great tag.